This was a good, successful and enjoyable season for the U13s. They have made lots of progress since the beginning of Year 7 and there were some sound performances this summer. of 150, albeit coming up just short. 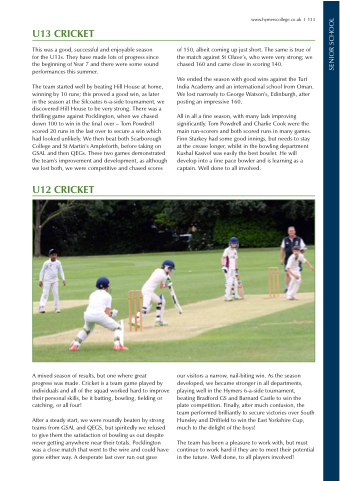 The same is true of the match against St Olave’s, who were very strong; we chased 160 and came close in scoring 140. We ended the season with good wins against the Turf India Academy and an international school from Oman. We lost narrowly to George Watson’s, Edinburgh, after posting an impressive 160. All in all a fine season, with many lads improving significantly. Tom Powdrell and Charlie Cook were the main run-scorers and both scored runs in many games. Finn Starkey had some good innings, but needs to stay at the crease longer, whilst in the bowling department Kushal Kasivel was easily the best bowler. He will develop into a fine pace bowler and is learning as a captain. Well done to all involved. progress was made. Cricket is a team game played by individuals and all of the squad worked hard to improve their personal skills, be it batting, bowling, fielding or catching, or all four! our visitors a narrow, nail-biting win. As the season developed, we became stronger in all departments, playing well in the Hymers 6-a-side tournament, beating Bradford GS and Barnard Castle to win the plate competition. Finally, after much confusion, the team performed brilliantly to secure victories over South Hunsley and Driffield to win the East Yorkshire Cup, much to the delight of the boys! The team has been a pleasure to work with, but must continue to work hard if they are to meet their potential in the future. Well done, to all players involved!